What Else Can I Expect From an Online Master's in Christian Counseling Program? The specialized field of Christian counseling infuses traditional counseling methods with an emphasis on Christian beliefs, biblical doctrine, and faith-based values. Christian counselors may meet with patients of any religious background (from devout to non-believers) to discuss a host of personal matters, including marriage and family life, personal finances, their faith or careers, as well as mental health issues like depression and anxiety, substance abuse, domestic problems, and other more serious issues. Today’s Christian counselors offer different therapy settings; some meet with clients one-on-one, while others meet with couples, families, and even large support groups. An accredited online Christian counseling degree program at the master's level prepares students to take the licensing exam in the state where they plan to practice. Programs generally require Christian counselors to earn a master’s degree; however, many Christian Counselors obtain a Ph.D. or doctoral degree, as well. A master’s degree in Christian counseling often includes coursework in two foundational areas: counseling theories and methodology and strategies for serving clients in a faith-based therapy setting. Programs almost always require internships and/or clinical residencies; these onsite courses give students the opportunity to receive training and guidance from established professionals in their field. Additionally, counselors who serve clients in a private practice must be fully licensed to work in all 50 states and the District of Columbia; specific requirements vary by state and the counselor’s area of specialization. Many of today’s students choose to earn their master’s in Christian counseling online rather than in a classroom. Web-based students follow the same demanding curricula as their brick-and-mortar counterparts and typically enjoy equivalent post-college job opportunities. The online study schedule proves ideal for students with part-time jobs, childcare duties, and other responsibilities that may interfere with campus-based learning. Learn more about what you can do with an online master’s in Christian counseling and what career opportunities you can look forward to with this comprehensive guide. WILL AN ONLINE MASTER'S IN EDUCATIONAL LEADERSHIP PROVIDE ME WITH THE SKILLS I NEED TO ADVANCE MY CAREER? A master’s in Christian counseling prepares students for the challenging -- yet rewarding -- career that lies ahead. The coursework delves into various approaches, theories, tools, and therapy methods used in today’s counseling field. Students also learn about the best practices for incorporating Christianity and biblical teachings into their therapy sessions. Many Christian counseling online master’s programs allow students to specialize in niche areas of the field, such as mental health, addiction, or youth and family counseling. A master’s specialization further boosts their standing in the competitive job market. Internships and residencies also give students the chance to apply the knowledge and skills they gained in a real-world counseling setting. WILL AN ONLINE MASTER'S IN CHRISTIAN COUNSELING WORK WITH MY SCHEDULE? Online Christian counseling master’s programs provide a flexible alternative to traditional classroom-based learning. Many of these programs offer an asynchronous, or self-paced, format, allowing students to access course materials, submit written assignments, participate in virtual discussions with other students, take exams, and contact their professors -- all from the comfort of their home computer. Current technology also enables them to study away from their desk using a laptop, tablet, smartphone, and other Wi-Fi-compatible devices. For added convenience, students can usually coordinate internships and residencies at locations reasonably close to their residence. WHAT JOBS CAN I GET WITH MY MASTER'S IN CHRISTIAN COUNSELING? While students can pursue most careers in Christian counseling with a master’s, successful graduates will need to apply for and obtain licensure if they plan to run a private practice; counselors working outside of a private practice must be licensed in some states, as well. The licensing requirements vary considerably. Mental health counselors, marriage/family therapists, substance abuse counselors, and behavioral disorder counselors must all log between 2,000 and 4,000 postgraduate training hours to be licensed, depending on the state where they plan to work. School counselors, on the other hand, typically do not need post-degree training — but some states may require one to two years of teaching experience. The best online Christian counseling master’s degree programs not only train students to enter the workforce, but also prepare them to complete the specific licensure requirements in the state where they plan to work. 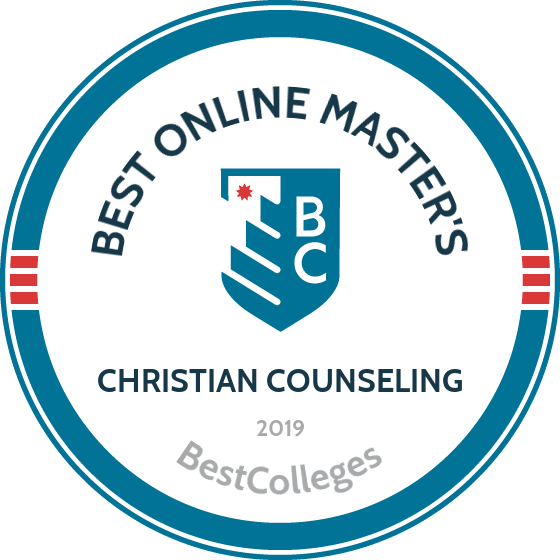 WHAT ARE THE BEST ONLINE MASTER'S IN CHRISTIAN COUNSELING PROGRAMS? Choosing a program is a personal decision and only you can properly evaluate whether a target school’s strengths match your educational needs. The following ranked list of schools serve as a helpful starting point in your search for the best online master’s in Christian counseling programs in the United States. We based our ranking on the courses schools offer, available specializations, student outcomes, career support services, and other criteria used to determine academic excellence. Before enrolling in an online master’s in Christian counseling program, be sure to contact admissions specialists at different colleges and universities to learn more about their specific master’s degree requirements and offerings. Based in Lynchburg, Virginia, Liberty University offers more than 600 academic programs online and on campus to approximately 100,000 undergraduate and graduate students. This Christian institution was founded in 1971 and maintains regional accreditation from the Southern Association of Colleges and Schools. Liberty holds additional membership with the Association of Christian Schools International and the Council of Independent Colleges in Virginia. The school's 36-credit online master of arts in pastoral counseling program blends biblical learning with counseling fundamentals to prepare graduates to meet the psychological and spiritual needs of others. The curriculum includes 24 credits of core coursework in foundational doctrines, spiritual formation, crisis intervention, and theories and techniques of pastoral counseling. Students then complete 12 credits from one of a variety of specializations, including leadership, life coaching, addictions and recovery, crisis response and trauma, and community chaplaincy. Learners also participate in a pastoral counseling internship to gain hands-on ministerial experience under the supervision of a professional pastoral counselor. Students can complete this online Christian counseling master’s degree in two years. Many graduates find careers related to social work, church counseling, pastoral leadership, and non-licensed counseling. Liberty provides tuition discounts to current, discharged, and retired military personnel and their spouses. Applicants to Liberty’s online master’s in pastoral counseling degree track must hold a bachelor’s degree earned with a minimum 2.0 GPA from an accredited institution. Founded in 1995, ASOT is located in Durham, North Carolina. The school combines theological training with service to the community through undergraduate and graduate programs in education, theology, and counseling. ASOT offers on-campus and online degrees to students. The school is accredited by the Transnational Association of Christian Colleges and Schools. ASOT’s online master of arts in Christian counseling program prepares graduates for counseling roles in the ministry and in the general public. The 69-unit program explores topics such as the Old and New Testaments, foundations and history of Christian thought, and counseling theories and techniques. Students complete additional courses in developmental psychology, personality theory, abnormal psychology, and counseling ethics. A 15-week clinical practicum caps the program. Students may also specialize in professional counseling or marriage and family therapy. The professional counseling specialization emphasizes interpersonal communication as well as theories and practices of career and crisis counseling. Alternatively, the marriage and family therapy concentration explores the theories and foundations of marriage, family, and child relationship development. Each concentration includes an additional 15-week clinical internship. As a private theological institution, ASOT holds articulation agreements with the Seminary Extension of the Southern Baptist Convention and numerous other institutions of higher learning. Learners interested in pursuing ASOT’s online Christian counseling master’s degree must submit two letters of reference and a spiritual autobiography. Initially established as a two-year institution in Decatur, Texas, DBU relocated to its current location in 1965. DBU provides a Christian-centered education through more than 110 undergraduate and graduate programs. This private university boasts an average class size of just 12 students. DBU maintains regional accreditation through the Southern Association of Colleges and Schools. DBU's online master’s in Christian counseling degree includes 36 credits that teach graduates the leadership and counseling skills needed to serve in theological and ministerial settings. Learners complete 18 credits of required courses in biblical servant leadership, applied hermeneutics, Christian history and heritage, systematic theology, and spiritual formation and worship. Core counseling courses include counseling theories and techniques, lifespan human development, abnormal psychology, and Christian counseling skills. Elective coursework and a field-based service ministry mentorship class round out the degree. DBU's master's in Christian counseling emphasizes the application of biblical principles to individual and group counseling. Students assess secular and Christian psychological theories and techniques while developing counseling skills applicable to their ministry. Graduates go on to pursue careers at local churches, religious organizations and agencies, and other community organizations. However, DBU’s online Christian counselor master's degree does not prepare graduates for professional counseling licensure in Texas. Applicants to DBU must submit two letters of recommendation, a current resume, and a statement of purpose. Established in 1968 in Watertown, Wisconsin, MBU welcomed an inaugural class of 173 students. Today, the university provides undergraduate and graduate degrees to more than 1,400 learners. Among its many offerings is an online master's in biblical counseling program. MBU’s 33-credit online biblical counseling degree blends theoretical and practical foundations of biblical and psychological counseling. Learners explore classic and contemporary theology, while gaining the skills needed to spread God’s word in ministry and/or in daily life. The curriculum applies biblical teaching directly to psychological theories, techniques, and practice. Graduates also prepare to continue their training in biblical counseling by building the research and communication skills necessary to pursue a doctorate. Students complete coursework in systematic theology, including classes in theological systems, apologetics and worldviews, and prolegomena. New Testament and Old Testament courses accompany specialized counseling classes in crisis counseling, marriage and family counseling, and counseling survivors of abuse. Students also complete an approved practicum during their final semester. This online master’s degree is comprised of eight-week sessions, and students participate in some live virtual classes. Additionally, a mandatory biblical counseling seminar requires students to attend a conference held in Indiana and interact with their peers and teachers face-to-face. Applicants to MBU’s master’s programs must hold a bachelor’s degree from an approved college or university. Students also need to submit an autobiography describing their personal, professional, and religious experiences and goals. MBU holds regional accreditation through the Higher Learning Commission. As one of the largest Jesuit institutions in the U.S., Loyola is rooted in the Roman Catholic tradition. Programs blend faith and reason, emphasizing social responsibility and educational excellence. The school's 17,000 undergraduate and graduate students attend classes across the university's three Chicago locations and a campus in Rome. Loyola holds accreditation through the Higher Learning Commission. The school's online master of arts in pastoral studies (MAPS) features five program tracks. Learners complete a 36-credit curriculum that includes eight core classes, three elective ministry courses, and a contextual education class. Students can also pursue specialized MAPS degrees in healthcare chaplaincy, religious education, church management, and digital communications. A healthcare integration program includes two workshops, and all degrees include an integration project where students demonstrate degree competencies. The healthcare chaplaincy program prepares graduates to apply pastoral counseling skills to a variety of healthcare settings and obtain certification as a Board Certified Chaplain with the National Association of Catholic Chaplains. The religious education specialization blends theories and techniques to prepare graduates to work with groups of all kinds. Additionally, the church management degree track focuses on business-related information, such as budgets, project management, marketing, and organizational leadership. Finally, students pursuing the MAPS digital communications concentration learn to integrate digital media in ministerial work. Applicants to Loyola’s MAPS program must submit two letters of recommendation and a statement of purpose. Amridge University — an institution affiliated with the Church of Christ — is based in Montgomery, Alabama. Founded in 1967, the school provides undergraduate and graduate programs in human resources, business administration, criminal justice, human services, and theology and ministry. Online degrees in divinity studies include two MA programs for Christian counselors: one in marriage and family therapy and one in professional counseling. Amridge University’s online master of divinity in professional counseling prepares graduates for professional counseling licensure through 60 credits of spiritual, counseling, and elective coursework. The curriculum includes courses in hermeneutics, spiritual leadership, and the New and Old Testaments, as well as classes in human development, theories of counseling and psychotherapy, and group counseling. Research and evaluation classes accompany clinical trainings, and learners complete a pastoral counseling practicum prior to sitting for a comprehensive exam. The online master of divinity in marriage and family therapy curriculum includes similar core coursework in spiritual leadership and biblical texts but covers additional topics that prepare graduates to become licensed marriage and family therapists. Both degree tracks require students to complete 500-600 clinical hours. Learners must arrange their clinical and practicum placements near their home under the guidance of an approved, licensed professional. Graduates can go on to work as therapists in church or professional settings, and some learners opt to pursue doctoral study in the field. Amridge University encourages students to contact state licensing bodies and national agencies about the latest licensing information. From its 90-acre campus in Nampa, Idaho, NNU serves more than 8,000 undergraduate, graduate, and continuing education students. As one of eight liberal arts colleges affiliated with the Church of the Nazarene, NNU coordinates numerous study abroad opportunities through the Council for Christian Colleges and Universities. The school also holds regional accreditation through the Northwest Commission on Colleges and Universities. The online master of arts in pastoral ministry at NNU prepares graduates to apply the Wesleyan-Holiness theology of scripture, reason, and experience to ministerial practice. Learners explore emotional and spiritual health, Christian virtue, and social engagement to provide holistic pastoral guidance and leadership. Students can complete the 40-credit curriculum in as few as 28 months with no residential requirements. Core classes include biblical interpretation, congregational education, and Christian history. Students then participate in online personal development labs to receive training in psychological resources, procedures, and testing. The program concludes with a supervised ministry practicum, which gives students the opportunity to work closely with a ministry mentor. During their practicum experience, learners focus on preaching, counseling, evangelism, and education. Applicants to the online master’s in pastoral ministry at NNU must have a bachelor’s degree from an accredited institution earned with a minimum overall GPA of 2.5; students must also hold a GPA of 3.0 or higher over their last 30 credits. Ideal applicants have professional or volunteer experience in the ministry. Students must submit two letters of recommendation and pass a criminal background check. Based in Virginia Beach, Regent University offers more than 130 undergraduate and graduate programs to its approximately 8,000 students. The school was founded in 1978 with the goal of providing quality academics from a Christian perspective. Regent's master of arts in human services with a specialization in counseling from a Christian foundation is a 30-credit program. Students assess models of inner healing, forgiveness, crisis counseling, and community trauma. Learners also explore ethics, faith, and theories of personality. Classes incorporate real-time interactions, groups projects, chat room discussions, and podcast lectures. The program does not lead to licensure. Core classes emphasize the foundations of human services, behavioral science, multicultural awareness, and professional ethics. Courses in the specialization include advanced counseling skills and techniques, counseling models and strategies, and community and crisis counseling. The program culminates in a capstone and field experience where students participate in 150 hours of on-sight work and gain at least 50 contact hours with clients in a human service setting. Applicants to Regent’s online master's in Christian counseling must hold a bachelor’s degree from an accredited institution earned with a minimum 3.0 GPA; ideal applicants have a degree in counseling, psychology, human behavior, or a related field. Learners must also submit a resume and a background questionnaire. Founded in 1901 by a Presbyterian minister, Trevecca has been affiliated with the Church of the Nazarene since 1917. This Nashville-based school currently provides undergraduate and graduate programs to almost 4,000 learners, including more than 1,000 online students. Trevecca maintains regional accreditation through the Southern Association of Colleges and Schools. Trevecca’s online offerings include a master of arts in religion with a concentration in pastoral counseling. Students complete core classes in ecclesiology, biblical methods and contextualization, spiritual formation, Christian doctrine and the 21st century, and theological and historical methods. Specialized coursework prepares graduates to engage and address conflicts and relationships and includes classes that cover marriage and family counseling, pastoral intervention in crisis, human sexuality, and process addictions. Learners also participate in a capstone course, completing a research project related to their career and personal goals. Students can complete the school's 33-credit online master’s in religions with a specialization in pastoral care in as few as 18 months. The degree prepares graduates for careers as pastors, youth ministers, and church leaders. Some graduates also go on to pursue a doctorate. Individuals with little to no background in the Bible can gain insights into religion and the role it plays in the public sector. Flat-rate tuition, financial aid opportunities, and asynchronous coursework provide relatively affordable and flexible access to Trevecca’s online pastoral counseling program. Applicants must hold a bachelor’s degree from an accredited institution earned with a 2.7 GPA or higher. Additional application materials include a letter of recommendation. With roots dating back to 1914, CCU grew out of the merger of Colorado Christian College and Colorado Baptist University in 1989. As an interdenominational institution, CCU now serves more than 8,000 online and on-campus students through its undergraduate and graduate colleges. Students can complete the school's 60-credit online master of arts in counseling in 2.5 years. This cohort-based program — accredited by the Council for Accreditation of Counseling and Related Educational Programs — blends faith and clinical counseling principles. Core counseling classes include counseling theory and skills, psychopharmacology, and crisis and trauma, while a biblical core is comprised of courses in theological and spiritual foundations for counseling. Learners choose from elective coursework in empathy graining, addictive behaviors, eating disorders, and anxiety and mood disorders. They also complete nine credits of practicum and internship courses. During these field experiences, students work at an approved site with a mentor to apply, integrate, and synthesize degree content. Applicants to CCU’s online master’s in counseling must hold an accredited bachelor’s degree earned with a minimum GPA of 2.5. Additional application requirements include a resume, formal essay, criminal background check, and interview. Learners can transfer up to 12 credits towards their degree. The online master’s in counseling at CCU prepares students to take both the national and Colorado state counselor certification exams. Out-of-state applicants should refer to their state's requirements for certification. Established in 1953 as South Texas Bible Institute in Houston, Texas, MACU moved to its current location in Oklahoma City in 1985. Along with holding regional accreditation through the Higher Learning Commission, MACU is affiliated with the Church of God. MACU offers online master of science degrees in counseling in three specializations. The online master’s degree in clinical mental health counseling emphasizes critical-thinking, leadership, and practical skills, along with the application of a Christian perspective to counseling in ministerial and secular settings. Alternatively, the online master’s in counseling in marital, couples, and family counseling prepares graduates to provide individual and relationship counseling infused with faith-based knowledge. Finally, the addiction and substance abuse counseling specialty offers learners psychological and psychotherapeutic expertise to work as professional counselors in the field. All students take core classes in career counseling and development, theories of counseling, research methods, and human development before going on to complete specialized coursework. Learners also complete 100 practicum or 700 internship hours of supervised clinical counseling fieldwork. All three program concentrations include 60-63 credits and prepare students for professional licensure through the Council for Accreditation of Counseling and Related Educational Programs. Interested students can request an on-campus or virtual campus visit. Grace College and Seminary sits on a 180-acre campus in Winona Lake, Indiana. Grace offers undergraduate and graduate programs through six schools and colleges, each rooted in spiritual growth and intellectual inquiry. Students can pursue several online associate, bachelor’s, and master’s degrees in liberal arts, human services, and management, as well as an online master of arts in ministry studies with a concentration in counseling. The online master’s in ministry studies at Grace includes concentrations in camp administration, women’s leadership studies, and counseling. Graduates can pursue careers as senior pastors, worship leaders, and outreach coordinators. This 36-credit program can be completed in two years. The curriculum features core coursework in the Old and New Testaments, historical development of doctrine, ministry preaching and teaching, and spiritual formation. Learners build their biblical understanding and develop theories and tools to integrate faith into intercultural and multicultural contexts. Specialized classes in premarital and marital counseling, counseling theories, and theological foundations of counseling explore Christian foundations of marital, individual, and group counseling. Students also assess problems and issues experienced by individuals who seek counseling in a Christian environment. Learners interested in pursuing Grace’s online master’s in ministry studies degree must submit reference forms. Grace’s two-week application process prevents long waiting periods, and the school charges a flat, per-credit tuition rate. Grace holds regional accreditation through the Higher Learning Commission. Founded in 1942, Faulkner University offers many undergraduate and graduate degrees, including seven that can be completed by distance learners. This Montgomery-based school is affiliated with the Churches of Christ and provides its 3,000 students with academic programs at its main campus; at extension locations in Mobile, Birmingham, and Huntsville; and online. Faulkner University’s online master of arts in Christian counseling and family ministry combines interdisciplinary coursework from the institution’s theology school and the Alabama Christian College of Arts and Sciences. The 36-credit curriculum includes five family ministry courses in family dynamics, individual or life span development, family strengths and theoretical foundations, research methods, and marriage and family theory. Counseling courses in suicide intervention and counseling, theology and counseling, group counseling, substance abuse counseling, and analysis of helping relationships precede a supervised experiential learning practicum. Students pursuing this online master’s in Christian counseling and family ministry degree pay by the credit. To apply to this non-licensure program, learners must hold an accredited bachelor’s degree and submit three letters of recommendation; at least one letter must be from a church leader. Applicants should also submit a statement of personal goals. Faulkner University maintains accreditation through the Southern Association of Colleges and Schools, and its graduate school of theology holds accreditation from the Association of Theological Schools. The following section discusses typical concentrations, courses, and program lengths for online Christian master's programs. While these details vary by program and school, most students earning a pastoral counseling degree online take similar courses and complete similar concentrations within an equivalent timeframe. Prospective students should investigate each program individually before making any decisions. Foundations in Theology: This survey course is a staple for any Christian counseling program, covering a range of theological topics as they pertain to counseling. Possible topics include the New Testament, the Old Testament, and close reading of different biblical passages. Counseling Theory and Technique: Students learn the basics of counseling by looking at different case studies and investigating the theory behind counseling's best practices. This course blends theory and practice while focusing on both psychology and developing interpersonal skills. Group Counseling: This course combines theory and practice as students examine best practices for group counselors. The course provides an essential professional skill for careers in community counseling, marriage and family therapy, and substance abuse counseling, which all involve some form of group counseling. Cross-Cultural Counseling: This course prepares students to operate as culturally sensitive counselors, providing a greater understanding of different populations with whom students may work. Topics may include whiteness, racism, microagressions, and other relevant areas. Practicum/Internship: Most accredited counseling programs give students the opportunity to apply their classroom skills in the field before completing their degrees. Programs may require around 400 combined hours for these two courses. In most cases, students work in a practice that operates in the counseling field they want to enter. Online students can generally arrange placement sites in their own communities. How Long Does It Take to Get an Online Master’s in Christian Counseling? An online master's degree typically takes 1-2 years to complete. Nevertheless, several factors can alter this typical completion time. Programs that use a cohort model -- in which students complete the same sequence of courses with the same group of peers -- offer more defined completion times than asynchronous, individually-paced programs, which provide a better fit for disciplined students. These students typically finish asynchronous programs more quickly than cohort programs by taking additional courses each semester. The number of credits required for each program may also affect how quickly students complete their degrees. Most master's curricula consist of around 36 credits; however, certain programs require as many as 54 credits. Additionally, students who take just one course per term often finish their master's program in three to four years, while full-time students graduate much more quickly. Attending an accredited school prepares graduates for future employment in the field. Regional and national accreditation indicate that a school meets the standards set by independent accrediting bodies. Regional accreditation applies to four-year institutions, while national accreditation focuses on vocational and trade schools. Schools that hold regional accreditation typically undergo a more rigorous review process. Students should seek out programs from accredited schools to ensure that employers recognize their degrees. Additionally, students should keep an eye out for national and programmatic accreditation. The Council for Accreditation of Counseling and Related Educational Programs (CACREP) oversees national accreditation for the counseling field. The CACREP accreditation boosts the credibility of any program in which you may choose to enroll. The U.S. Department of Education and the Council for Higher Education Accreditation oversee the accreditation process. Both seek to ensure the quality of higher education in the U.S. by setting the standards for accreditation and evaluating schools and programs against those standards. While the Department of Education focuses on all matters related to public education, CHEA focuses exclusively on higher education accreditation. Students can find a list of all accredited schools on CHEA's website. The following table features data from PayScale that details average salaries over the lifespans of five different careers: substance abuse counselor, marriage and family therapist, school counselor, mental health counselor, and licensed professional counselor. Each of these professions represents a possible avenue for graduates who hold a pastoral counseling degree online. Starting salaries in the counseling field vary, but most of these careers offer outstanding salary growth over time. Most students who enroll in faith-based counseling programs possess emotional intelligence, innate people skills, and a desire to do good in the world. These skills enable individuals to thrive in counseling careers that allow them to help clients in small group or one-on-one settings. The following section explores three possible career paths for graduates with a biblical counseling degree. The section includes a chart featuring data from the Bureau of Labor Statistics that details median annual salaries and projected growth rates for three professions. School and Career Counselors: School and career counselors help students in high schools, middle schools, and elementary schools develop academic and social skills. In high schools, counselors assist students with choosing their courses and applying to colleges. They also work one-on-one with students of all ages to help them sort through problems in their lives. School counselors need a master's degree and additional certification. Mental Health Counselors and Marriage and Family Therapists: Marriage and family therapists facilitate conversations between couples and families to help them talk through their issues. They can work at private practices or in mental health centers. All marriage and family therapists must hold a master's degree in addition to state-specific licensure. Substance Abuse and Behavioral Disorder Counselor: Substance abuse and behavioral disorder counselors help individuals experiencing alcoholism, drug addiction, mental health disorders, or eating disorders combat their issues. They can work in a variety of settings, including prisons, private practice, and mental health centers. In most cases, professional counselors need a master's degree. Networking and continuing education resources provide opportunities for career growth and development. Professional organizations offer a great entry point for students who want to learn more about their chosen career path. Below, you’ll find three of the country’s most prominent organizations established for professional Christian counselors. These organizations host networking events, provide online trainings, maintain active job boards, and offer other services for career-ready college graduates. Resources like these often prove invaluable as you complete your degree requirements and prepare to enter the job market. American Association of Christian Counselors: The AACC is a faith-based nonprofit organization that today represents nearly 500,000 licensed counselors, pastors, and other church personnel. Members receive complimentary magazine and newsletter subscriptions, webinars, and continuing education credits and exclusive discounts on books, conference entry fees, and other services. National Christian Counselors Association: Founded in 1981, the NCCA today serves as one of the world’s largest organizations dedicated to training and supporting faith-based counselors. The association holds an annual conference in a different major U.S. city each year, and the website features an extensive counselor directory. American Counseling Association: Founded in 1952, the ACA functions as the world’s largest professional organization for professional counselors and boasts more than 52,000 current members. The ACA website features an extensive virtual knowledge center that contains information about licensure requirements, diagnostics, ethics, and other important areas of the field. The ACA also provides continuing education opportunities, journal publications, and an online job board. Online programs can provide an affordable and flexible option for women trying to balance the demands of work, family, and education. We’ve curated a list of valuable scholarships specifically for women.